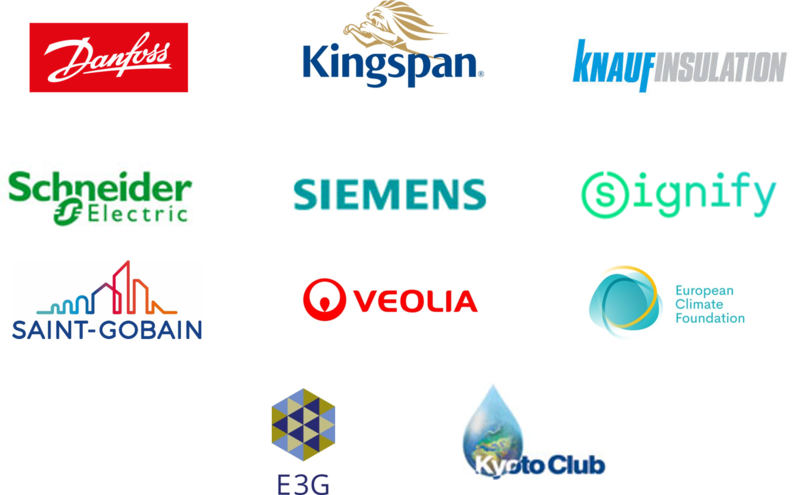 Cross-sectoral alliance of businesses support strong climate-proof ERDF and Cohesion Fund to leverage the necessary private investments to deliver the Paris Agreement. The Multi Annual Financial Framework (MFF) post 2020 is a unique opportunity for the EU to demonstrate coherence with its long-term energy and climate objectives and show commitment to deliver tangible benefits to European citizens. Our businesses see the MFF as a necessary trigger for outlining the much-needed long term political direction for mobilizing private investments towards a decarbonized European economy. Public EU funds alone are not sufficient to finance the energy transition and alone cannot address the urgent call from IPCC scientists to limit temperature increase to 1.5°C and decarbonise our economy by 2050 at the latest. According to a recent report of the European Commission, the EU budget contribution to mitigation finance covers as little as 5-7% of the total resource required. However, the EU budget has an important leveraging role to play in attracting private investments necessary to fill the gap. The investments in clean technologies, and in particular in cost-efficient energy efficiency projects, will only get unlocked if the EU provides long term certainty to the private sector. Our position papers “A climate-proof budget to drive the EU clean energy transition to a low carbon economy” (released in March 2018) and a “A climate-proof budget to leverage the necessary investments to deliver the Paris Agreement” (released in November 2018) outline in greater detail our views and call for a full application of the Energy Efficiency First principle, increased climate mainstreaming and improved climate proofing. Increase to 40% the overall target of expenditure supporting climate objectives. Such increase is necessary taking into account the magnitude of the climate change challenge and the level of support required to achieve the EU climate and Paris Agreement objectives. Prioritize investments in energy efficiency and promote the integral energy saving technological uptake (both on the energy demand and supply sides) in sectors with high potential. To prioritize energy efficiency investments, ERDF and Cohesion Fund Regulation should fully apply the Energy Efficiency First principle and therefore embed the principle to first assess the economic opportunity to reduce consumption through cost effective energy efficiency solutions before investing in sustainable new supply capacity. In our view, all investment decisions in the field of energy and climate change must be guided by long term decarbonisation objectives. Public resources should be spent in an intelligent, efficient and effective way, with attention to a just transition and on priorities with the highest economic, societal and environmental value. It does not make economic and environmental sense to invest in new fossil fuels infrastructures and misuse public resources that could lead to the creation of stranded assets. Ensure strategic alignment with the National Energy and Climate Plans (NECPs) which are set to outline Member States’ strategies and the necessary financial resources to implement the new energy efficiency framework for 2030 (EPBD and EED) and unlock the growth and job potential of these important directives. Include a clear link between investments and the EU’s sustainability taxonomy. This is the right approach – already adopted by the Parliament for the InvestEU programme – and should be embedded across all EU funding instruments post 2020. Support investments in projects that at least comply with the minimum legislative requirements. For example, in the building sector, ERDF and CF resource should be used only for energy efficiency improvements that are aligned with – or go beyond, in case of new build projects – the minimum energy performance requirements for buildings. 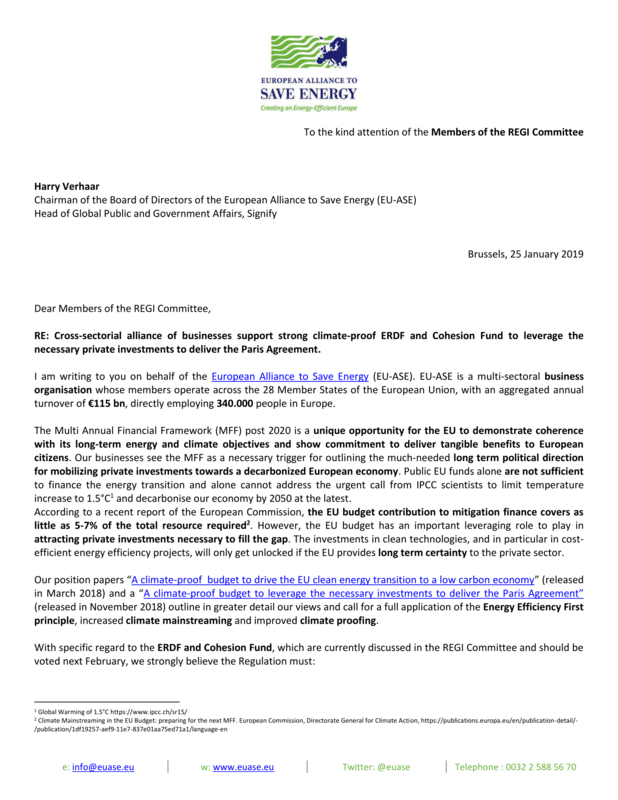 Dear Members, ahead of the vote in February, we urge you to support an ERDF and Cohesion Fund Regulation which considers our views and envisages a much smarter, carbon emission neutral, energy and resource efficient society.